Making Thanksgiving croissants is a three-day process. I started making the compound butter two days ago. I paddled together butter and Thanksgiving spices: dried sage, dried thyme, granulated onion, onion powder, salt, sugar, pepper, and a little turmeric for color. We developed the recipe from looking at the ingredient list for Stovetop stuffing. Roast and then simmer the giblets with veggies to get some flavorful broth to add to the pan drippings. Start with a (I know, it’s horrible) store-bought stock, dissolve flour or cornstarch in water, add it to the boiling stock, then add the giblet stock and pan drippings. If you use decent quality store stock, you won’t notice the difference and you can make half a gallon of gravy. Or buy a couple of turkey thighs or legs and roast them a few days ahead and store the deglazed pan drippings in the freezer until the big day. Butter at room/ambient temperature really depends on what that temperature is. Today, my place was above 25 C/77 F – butter left on the counter would not be spreadable, it would be soup. Ever now and then, I see butter bells in the local thrift stores. It’s an interesting idea to have spreadable butter, cooling the butter by submerging it upside down in water. But I’ve heard about mixed results – the butter falling into the water, and most are not translucent so you don’t know until you lift the lid. Also, butter bells are still susceptible to melting butter if the temperature gets high enough. You could set some butter out ahead of time, or grate it. Is It Finally Time to Accept Fat as the Sixth Taste? There are five acknowledged tastes: sweet, sour, bitter, salty, and (slightly more controversially) umami. For awhile now, researchers have suggested the existence of a sixth taste: fat. Now, a new study has researchers saying they may have finally isolated it—and they’ve given it a name: oleogustus. Source: Is It Finally Time to Accept Fat as the Sixth Taste? Fat seems like a broad term to me. Pig fat (lard) has a vastly different taste than butter (milk fat), and both are different than olive oil (plant fat). All have very distinct tastes. Does oleogustus encompass all of those? Do all fats have that exact thing in them? What Makes Peanut Butter Sticky? Arachibutyrophobia is a proposed humorous name for the fear of peanut butter getting stuck to the top of your mouth, coined by Charles M. Schulz in a 1982 edition of his famed Peanuts comic strip. But why does peanut butter have such a tendency to get stuck in your palate when so many other foods don’t? As it so happens, peanut butter contains a perfect storm of ingredients seemingly designed with the express intent of creating a peanut flavoured choking hazard. For starters, peanut butter, shockingly enough, contains a lot of peanut oil, which makes it incredibly difficult for your saliva to perform its normal task of helping in this first stage of processing food; as we all know, oil and water don’t really like to mix. Source: What Makes Peanut Butter Sticky? While I know natural peanut butter won’t be appreciated by everyone (heathens! ), here’s something that can be: instead of sliced bread – use tortillas. Warm them in a pan on both sides, adding the peanut butter after you’ve flipped the tortilla. I like mind a little crispy, but if you like yours soft, just set the stove to a lower temperature and don’t cook as long. Tip for natural peanut butter (or tahini/etc that separated): flip the jar upside down for a day or two before you open it. The oil will move to the bottom, more or less, and make stirring easier. 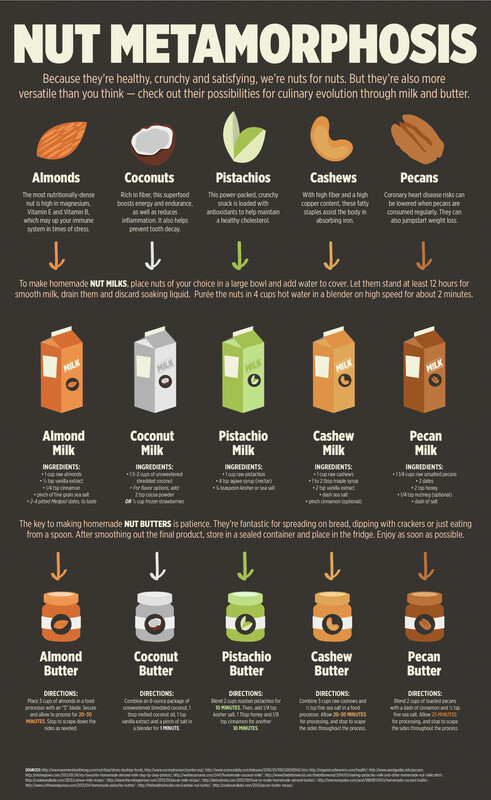 If you have a peanut allergy, you might be interested in this post about other nut butters (and milk). You’ll need a blender or food processor. Making the “milk” generally requires soaking the nuts in water for 12 hours. Calling these “milk” is a misnomer, in the same way vein as “nut butter” but it’s done for easy understanding of how and why these would be used.